Hubby and I never really celebrate Valentine’s Day. Not that I’m judgey of people who do…I completely understand the desire to feel that little bit of extra love and attention or spend time with your special someone over a nice dinner. However, Hubby’s birthday is the week before Valentine’s Day. Our anniversary is literally a month before. Two weeks before that is New Year’s, and a week before that is Christmas. So, for us, there are numerous opportunities around that time of year to make sure the other person knows how we each feel, so we just never really got into celebrating Valentine’s Day. That said, the day still calls for opening some bubbly to enjoy over dinner. 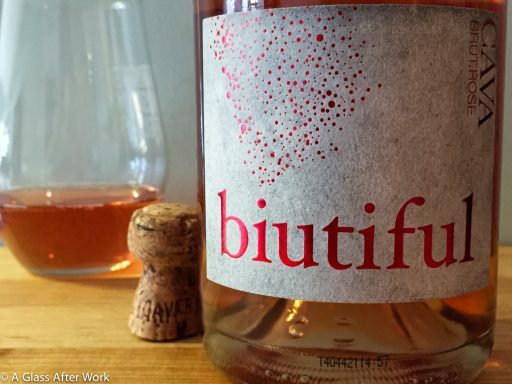 The Biutiful Cava Brut Rosé (snooth) is a sparkling wine from Spain that is made with 100% Garnacha grapes. The wine had a nice orangish-pink color with persistent bubbles. On the nose, there were raspberries and strawberries with a hint of apricot. In the mouth, there were tart raspberries and strawberries mixed with peaches and cream. The wine had a light-to-medium body and good acidity. Is this worth a glass after work? Definitely! If you see this wine in the store, grab it; you won’t be disappointed. At $14, this rose Cava is easily drinkable, food-friendly, and very affordable. The acidity create a nice brightness and bubbles dance. 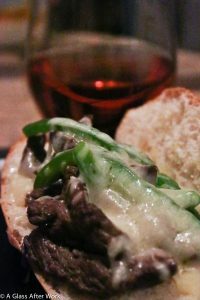 I paired the sparkler with homemade cheese steaks, and the wine cut through the fat from the cheese and the meat beautifully, making for a nice pairing. I also think this wine would be a enjoyable over a Thanksgiving turkey dinner or on a picnic blanket with friends while eating prosciutto and cheese. Overall, this Cava definitely added a nice touch to our casual Valentine’s Day dinner, and I won’t hesitate to grab another bottle when I see one. Question of the Day: Are you someone who celebrates Valentine’s Day or do you tend to treat it like every other day? Purchased at 7 River Mart, the convenience store I walk by during my commute.